Lyn Hejinian was born in Alameda, California, in the San Francisco Bay Area, and educated at Harvard. 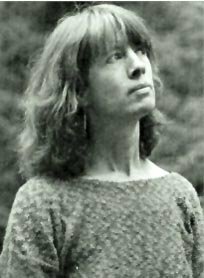 She was editor of Tuumba Press from 1976 to 1984, when it pioneered in issuing a series of fifty Language poet chapbooks. She has also been co-editor of Poetics Journal for over twenty years. What Juliana Spahr said of one of Henjinian’s earlier books certainly applies to the poem sequence “The Distance” as well: "Hejinian's work often demonstrates how poetry is a way of thinking, a way of encountering and constructing the world, one endless utopian moment even as it is full of failures." In much of her work, Hejinian explores how language constructs the self. Language, as she has put it, “is an order of reality itself and not a mere mediating medium.” Thus any attempt at autobiography, as her signature book My Life demonstrates, will be riddled with erasure and endlessly branching connotation. Hejinian teaches poetics at UC-Berkeley. Some Notes on Lyn Hejinian's 'The Distance'"